Otago Daily Times editor Barry Stewart (front left) with Prime Minister Jacinda Ardern and Allied Press chief executive Grant McKenzie at the Otago Daily Times Class Act 2018 awards ceremony at the Otago Museum yesterday. Row 1: Connie Searle (Waitaki Girls' High School); Indigo Little, Alex Bailey (Wakatipu High School). Row 2: Renata Burnett (Waitaki Girls' High School); Scott Kitto, Jacob Tuisani (Waitaki Boys' High School); Anna Jordan, Bronson Blackbourn (Tokomairiro High School); Alicia Staniford (The Catlins Area School). Row 3: Logan Stadnyk, Rachel Beattie (Taieri College); Alice Murray, Briar Mills (South Otago High School); Sian Hutchins, Katie Reed (St Peter's College). Row 4: Rebecca Whittet, Molly Kay (St Kevin's College); Olivia O'Neill, Isabelle Robertson (St Hilda's Collegiate); Brooke Johnston, Alex Darling (Roxburgh Area School). Row 5: Sean Woo, Nathan Hill (Otago Boys' High School); Erin Marshall, Lara Wall (Queen's High School); Sarah Hubbard, Lucy Matehaere (Otago Girls' High School). Row 6: Rina Watt (Maniototo Area School); Holly Wigg (Mount Aspiring College); George Sabonadiere, Bella Rennie (Logan Park High School); Jameisha Sheridan (Lawrence Area School). Row 7: Liam Hewson, Finn Ward (King's High School); Timothy O'Farrell, Elliot Blyth (Kavanagh College); Samara Marks, Cameron Hall (Kaikorai Valley College). 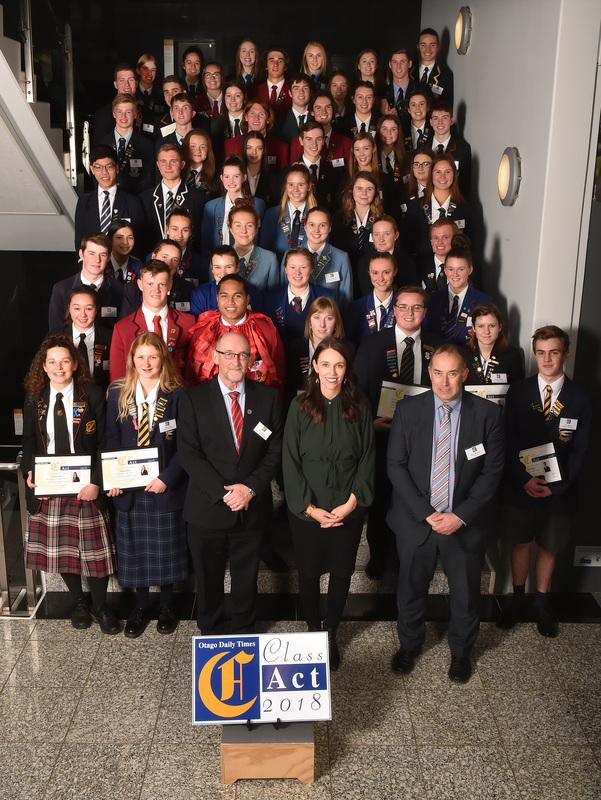 Row 8: Jack McLaughlan, Ben Mitchell, (John McGlashan College) Katie Ratahi, Mitchell Quested (East Otago High School); Danielle Tripp, Laura Smith (Gore High School). Row 9: Ella Creagh, Beau Meehan (Dunstan High School); Caitriona MacTaggart, Regan Hucklebridge (Cromwell College). Row 10: Kate Truman, Lydia Joseph (Columba College); Grace Richardson, Luci Butler (Blue Mountain College); Ruth Bridgman, Sam Spiers (Bayfield High School). Inset: Zoi Sadowski-Synnott.